How many roads must an island walk down? 1.2km = RM22m! I was told that the most expensive stretch of road in the country has been approved for construction by the relevant authorities recently. And no, that road is not in some wealthy parts of KL or Selangor, and it is not in Penang or Iskandar, Johor, either. 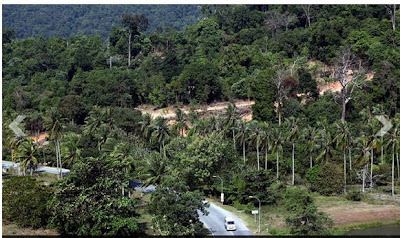 The road that might as well be paved with gold is on the island of Langkawi and will be located where there is no necessity for another road to be built, residents and environmentalists claim. The Mole has the story, Langkawi's road to environmental shame? This must be the work of Mahatdir's cronies. UMNO B's must have a middle finger in someone arse in this. No? It's in Kedah, a Pakatan State control by PAS. WTF. Religious people must not be too selfish for worldly rewards. No? This Road was mooted by YOUR OVERLORD MAHATHIR MOHD! Shouldn't You Go to him for the Question on How Come?. Is this road a Federal project? I am betting it is. Jgn buat perangai bodoh sombong. Baca & fahamkan isu ini dgn jelas...WTF!!! What difference does it make if the road is a Fed govt project or not? Or if the developer/contractor is Chinese Malaysian or China Chinese. The point is, they are doing it without regards for the environment. State authorities or Federal authorities have the same responsibility to protect our environment. Before we go to Mahathir, why dont u stick your middle finger first to yb azizan's and kedah pr gomen's asses? Satu lagi Projek UMNO/BN !! High cost come from many factors, i.e land acquisition, rock/earth work, slope protection, concrete structure, fees to consultants, supervision, import of materials from tanah besar, logistic etc. So RM22m for 1.2km looks expensive to lay man but not to an engineers. Rocky should state clearly..who is doing it ...Fed Govt. or Penang State Govt....and don't talk about environment where Umno b Govt...sees $ sign and do not care one bit environment and welfare of the people. Everyone knows...half of Langkawi is owned by Mahathir and Diam. Both bought land cheap....pent billions developing it...decades ago. Why can't it be developed...allowing the real owners of the land be millionaires? Mahathir and Diam are the biggest rouges and thieves...stealing...so call.. "lawfully"...applying "head I win...tail you lose"... in many projects. pls open our eyes and mind. there is ongoing road project in Terengganu that cost RM 240.0 MILLION for a stretch of 6 km only. Aiya rocky, langkawi is your master mahathir's pet project. Go ask your master lah why he mooted in during his time before. Apale si Apek Monsterball ni? Hoi, hang pakai surat beranak pasar gelap ke seludup masuk Malaysia? Like RockyBru said, someone from the authority be it federal or state govt must come clean what is the need of the project. It is simple. Not partisan politic. From what I know, federal govt only built roads which are main roads. Any other roads are state roads (except for highways). Never the less, not political party issue. If state roads or federal roads built by JKR must have signboard stating project name or it will be listed on the JKR website. So, this could be privately developed road to be handed over to Government/JKR, maybe as a replacement for the existing road. And this is quite logical because there is no necessity to build another access / through road if the existing road is already passing the said proposed new development. However, if I'm the developer of a new resort across the existing road, I would want it closed and kindly replaced with the new road so that I can apply for TOL of the beach...am I smart or not? I heard the developer is very gung-ho with strong cables either with BN or even with DAP in Penang (many projects by them since 2008). This fella No need to get official approval will start work as long as all the relevant ministries and gov dept/agencies eg Works ministy, MOF, Lada,Kedah UPEN, Land dept, etc already given surat sokongan and surat tiada halangan which are like passport for the developer to get the local relevant technical authorities such as state JKR or majlis bandaran to just chopped approved without scrutinizing the develolment plan submitted. So in this case, whether all authorities sudah approved is irrelevant because those suppport and no objection letters are as good as approved. 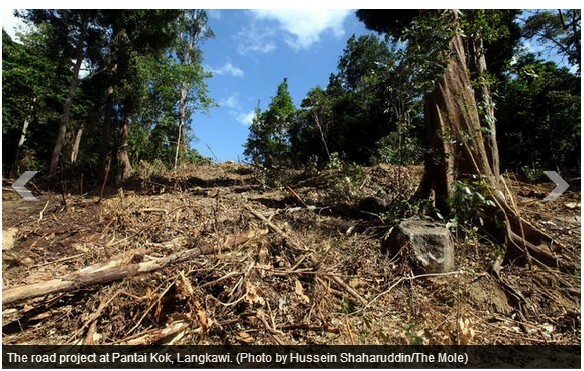 All the the supposedly 'rogues' you mentioned sudah tak boleh gostan...melayu cakap sudah jadi buloh (bamboo). So no need to waste your time (although I rasa you ada manyak time, or maybe fulltime checking this blog)...why don't you use your many times helping to stop potential wrongdoings/corruptions and try to curb wannabe or up and coming (or maybe oredy there) rogues like 'Tokong' in Penang and 'Gagap' in Selangor? Or are you actually hired to divert attention from them? "supposedly rouges".....?????? ?and it goes on and on....me..."hired to divert attention"
IF YOU ARE NOT HIRED TO DIVERT OR COUNTER ISSUES THAT ARE DAMAGING TO PAKATAN, THEN YOU MUST BE A BIG BIG BIG ! @&#HOLE (SO BIG BECAUSE YOU SUKA KENA HANTAM AT THE BACK THERE YA? HEHEHE)! EVEYBODY'S IN IT FOR THE MONEY LAH! DON'T BELIEVE? GO ASK 'TOKONG' AT KOMTAR (EH BY THE WAY AHH WHEN HE GONNA CHANGE THAT BUILDING'S NAME TO 'KOMLKS' TO COMMEMORATE (OR IS IN MEMORIAM OR MEMORY OF?...MY ENGLISH NOT SO GOOD, SORRY YA)HIS FARTher? HEHEHE)...OH YA HAVE A GOOD DREAM AND IF YOU ARE SMART DON'T WAKE UP LOH BECAUSE YOU NEED TO GO BACK TO SLEEP IF YOU DO...IF YOU FAHAM APA SAYA CAKAP LAH...HEHEHEHAHA!!! hahahahahahahaha.....idiots getting mad.....just like before....but very very few now. and Najib faces his final curtain. Many a tear has to fall...but it's all in the game. Soon you'll be looking for jobs...like gardeners and drivers. Your carrying balls days will soon be over!! Hehe, surely you know monsterball that My Way is Tun Dr Mahathir's song. He and it for 22 years that he was Prime minister of this country. The best PM the Malays and Malaysia ever had since Tun Perak.